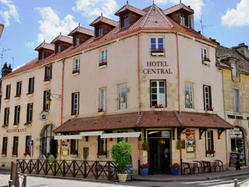 Right in Beaune's city centre, in the beautiful Burgundy region, the Hôtel Central, dating back to the 16th century, offers quality accommodation in a nice, peaceful setting. The property is close to the Tourism Office and is surrounded by art galleries, shops, and wine cellars. The hotel also offers fine dining and relaxation areas, such as a TV lounge and a bar where guests can unwind with a drink. From Beaune railway station: 1 km.